Here’s the thing: creating one from scratch is not hard to do. But for whatever reason, it’s incredibly scary, especially for beginners. First: no one really knows what the heck a sourdough starter even is. Wild yeast? Levain? WHAT?! Third: no two starters are alike. They might look similar, but each one has their own unique personality and will behave differently in baking. Plus, it doesn’t help that there are several ways to make a starter, with methods that include raisins, potatoes, pineapple juice- even sugar. There’s just too much conflicting information out there, and like you, I’ve found myself totally frustrated and confused. Take it from me and my mistakes: there’s hope. 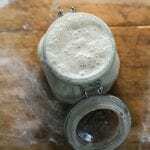 In this tutorial, I’ll teach you how to create a killer sourdough starter with just two simple ingredients: flour and water. 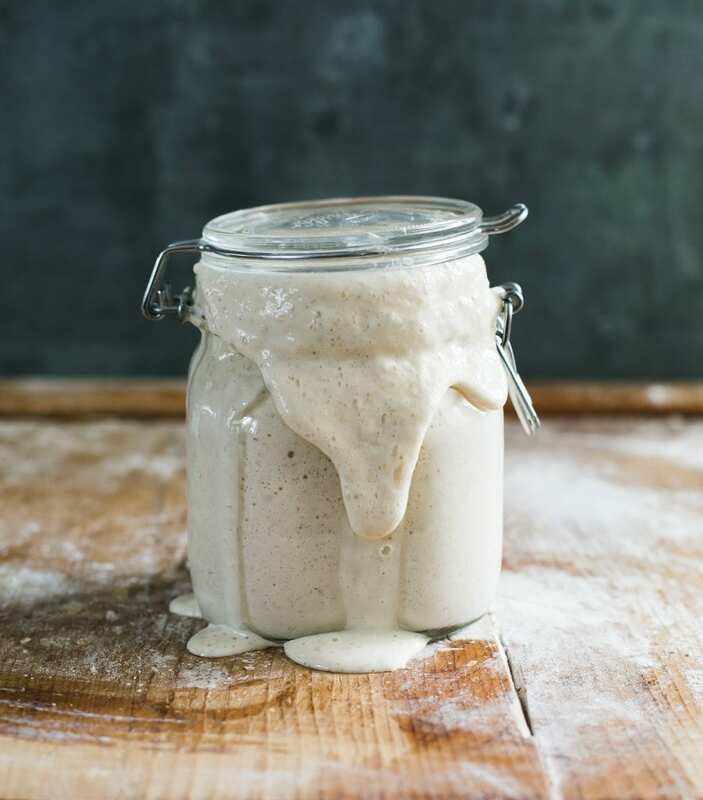 Once your starter is established, it can be used to make all kinds of incredible sourdough bread like, crusty artisan loaves, sandwich bread, bagels, focaccia and so much more. Yum! The overall process takes about 7 days from start to finish. However, it’s not uncommon for it to take up to two weeks or more for the starter to become active. It all depends. I know this timeframe sounds a bit vague and everything, but growing yeast in a jar (that’s basically what you’ll be doing) can be unpredictable at times. Please be patient if the process takes time- this is key. In short: you’re basically adding flour and water to a jar, feeding it with more flour and water over time, and then waiting for it to become bubbly and double in size. That’s it. Can I ask you a favor though? There’s a lot of information out there, and you will fall down a major rabbit hole if you start poking around. Just stick to this tutorial for now and follow the steps. You can torture yourself later with what everyone else is doing. 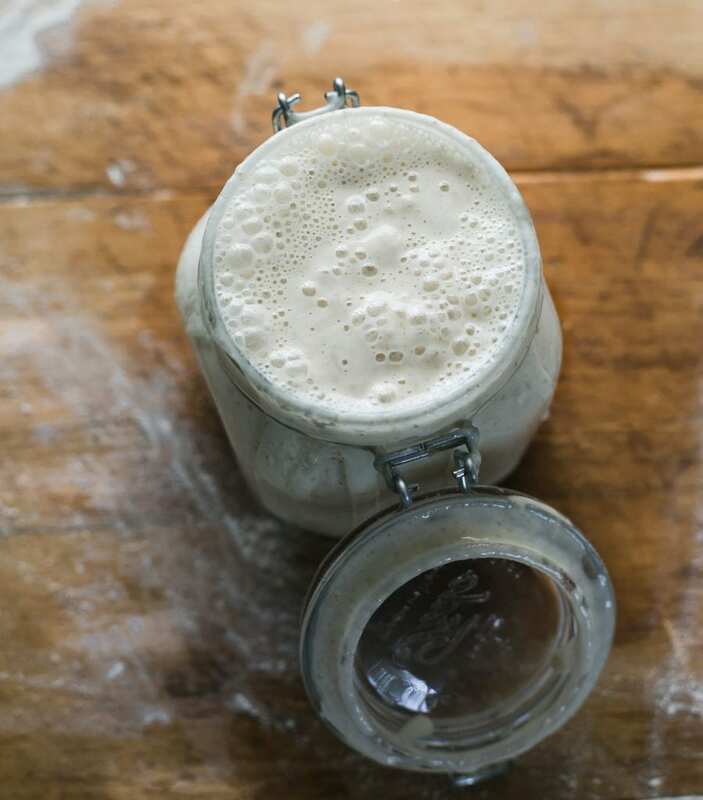 So, What Is A Sourdough Starter? 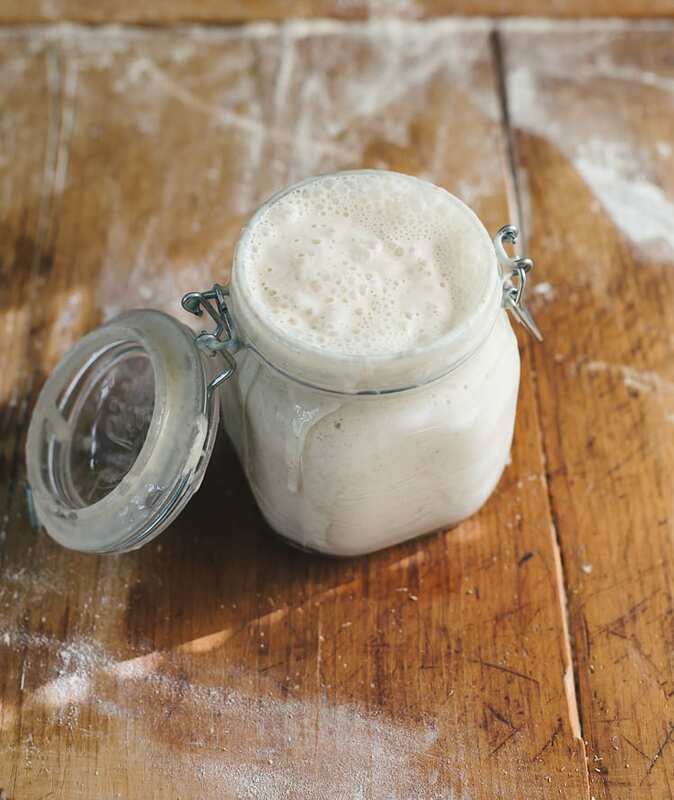 Simply put: a sourdough starter is a live culture of flour and water. Once combined, the culture will begin to ferment which cultivates the natural yeasts found in our environment. A small portion is added to your bread dough to make it rise. Commercial yeast IS NOT required. Of course it does. And it should. All you need to know is this: natural “wild” yeast is all around us. It can be found in a bag of flour flour, in the air, on your hands… Just because you can’t see it, doesn’t mean it’s not there and doing its thing. Tip: Use regular, unbleached all purpose flour for best results- skip organic. The enzymes are different which can hinder the rising process the first time around. I use either KAF, Trader Joe’s or Whole Foods. Filtered water or tap water is fine. Use the latter if you know it’s mostly chemical/chlorine free. Tip: Looking for a warm spot? Place your starter on a cookie sheet inside the oven (turned off) with the light on. You can also use a proofing box set to your desired temperature, or a microwave with the door ajar and light on. Today, you’re going to check if any small bubbles have appeared on the surface. Bubbles indicate fermentation, which is what you want! It’s okay if you don’t see anything; the bubbles might have appeared and dissolved overnight while you were sleeping. You don’t have to do anything else right now. Rest the starter in your warm spot for another 24 hours. Day 2 (Con’t): What’s that brown liquid? During the creation process, and even after your starter has been established, a dark liquid might appear on the starter (the image above shows the liquid in the middle of the starter- it’s usually found on the surface). This liquid is called “hooch” and is an indication that your starter needs to be fed. It also has a very stinky smell, similar to rubbing alcohol or gym socks. Any time you see this liquid, it’s best to remove it along with any discolored starter present. Just smell it- it’s gross! Whether bubbles are visible or not, it’s time to start the feeding process. To begin, remove and discard approximately half of your starter from the jar. The texture will be very stretchy. Add 30 g (1⁄4 cup) of all-purpose our and 30 g (2 tbsp) of water. Mix with a fork until smooth. The texture should resemble thick-ish batter or plain Stonyfield plain yogurt at this point, so add more water as needed. Cover loosely, and let rest in your warm spot for another 24 hours. DAYS 4, 5, AND 6: Keep on Feeding! Repeat the feeding process outlined on Day 3: Remove and discard half of the starter, and feed it with 30 g (1⁄4 cup) of all-purpose our and 30 g (2 tbsp) of water. As the yeast begins to develop, your starter will rise, and bubbles will form on the surface and throughout the culture. When the starter falls, it’s time to feed it again. Tip: Place a rubber band or piece of masking tape around the jar to measure the starter’s growth as it rises. 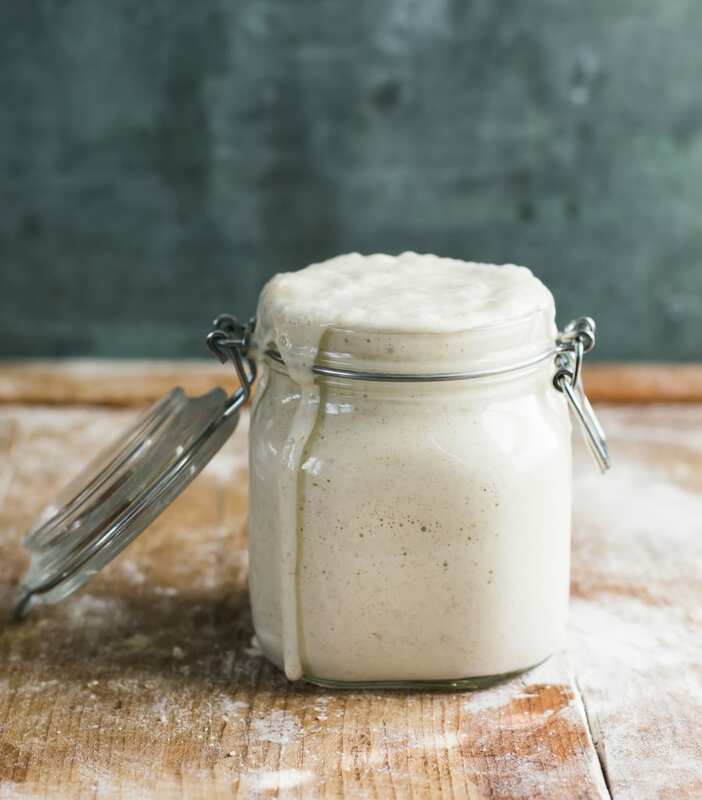 By now, your sourdough starter should have doubled in size. You should see plenty of bubbles, both large and small. The texture will be spongy, fluffy, and similar to roasted marshmallows (think: s’mores). It should also smell pleasant, and not like stinky gym socks. If these conditions are met, your starter is now active and ready to use! Please keep in mind, if your starter is not ready at this point which is quite common (the temperature might be too cold, your timing might be off, the yeast might need more time to grow etc. ), continue to feed it for one to two weeks or more. Be patient! Also, don’t fret if your starter doesn’t look exactly like my pictures above. As long as your starter is bubbly and it has doubled in size, you’re all set. Tip: Wondering if your starter is ready to use? Do the float test. Drop a teaspoon of bubbly starter in a jar of water; if it floats to the top you can use it. 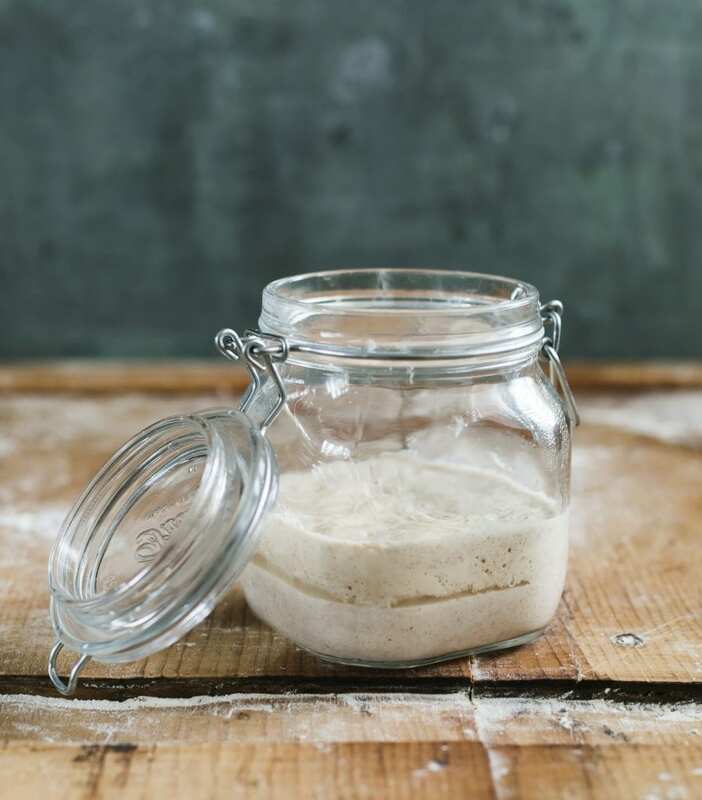 The very last step is to transfer your sourdough starter to a nice, clean jar. In keeping with tradition, you can also name it- and please do! My starter is called Dillon, after my oldest boy. 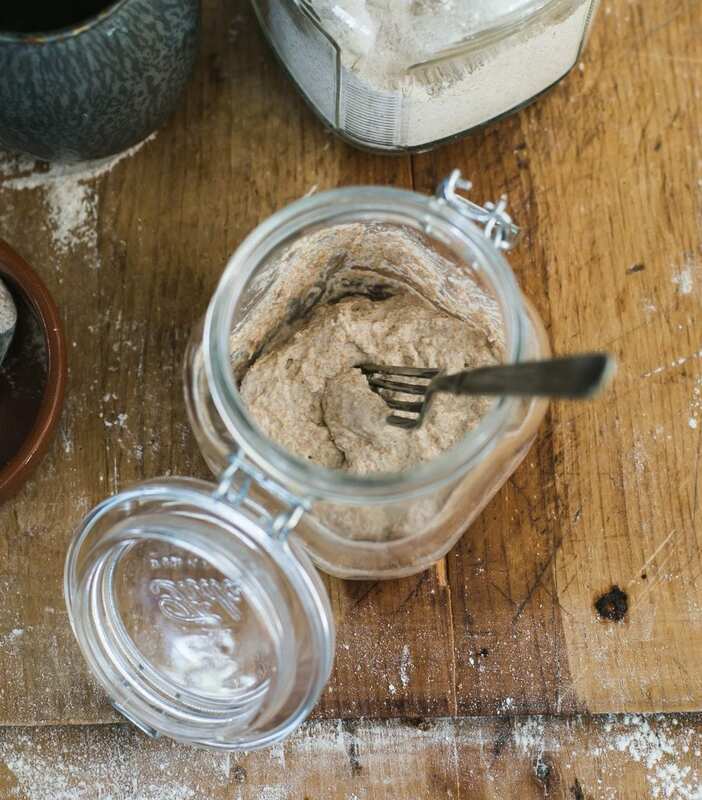 Now, are you ready to bake some incredible sourdough bread? Click here for my Beginner’s Guide! 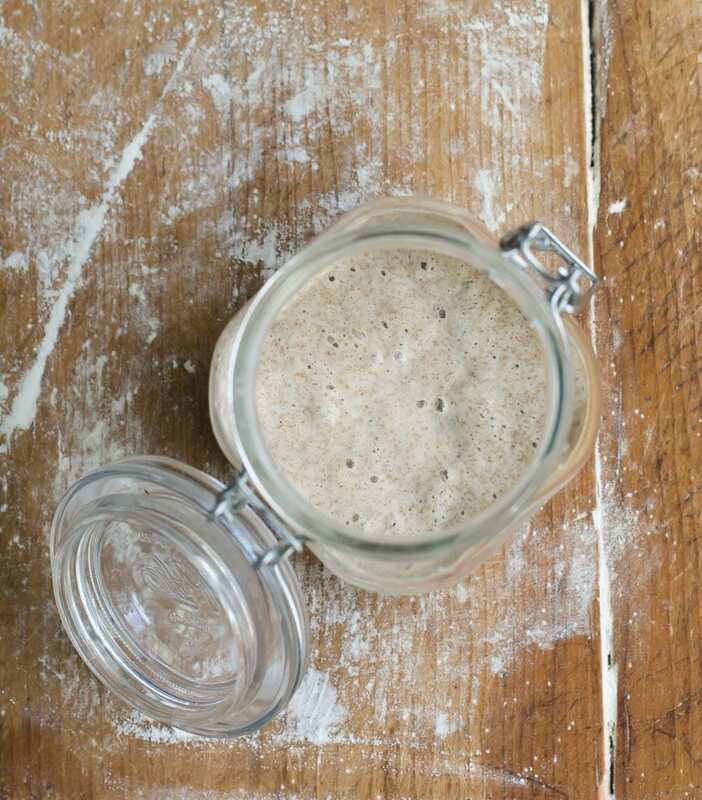 So you’ve created a sourdough starter! Now what? Just like any living creature, it must be kept alive with regular feedings to maintain its strength. If your starter is not strong, your bread will not rise. Caring for your starter is much easier than you’d think, and certainly won’t take hours of your time. You’re going to repeat exactly what you’ve done on Day #3 in the creation process. Replenish what’s left in the jar with fresh all purpose flour and water. Feed your starter everyday if it’s stored at room temperature. If you keep it in the fridge, feed it once a week. 2.) When Is Your Starter Ready to Use? If you’re having trouble spotting the signs, don’t forget to place a rubber band around the base of the jar to measure the starter’s growth. You can also try the float test mentioned above: Drop a small dollop of starter into a glass of water. If it floats to the top, it’s ready to use. Once your starter is established, you have two storage options to consider. At Room Temperature: If you bake often—let’s say a few times a week—store your starter at room temperature. This will speed up fermentation, making the starter bubbly, active, and ready to use faster. Room temperature starters should be fed one to two times a day, depending on how quickly they rise and fall. 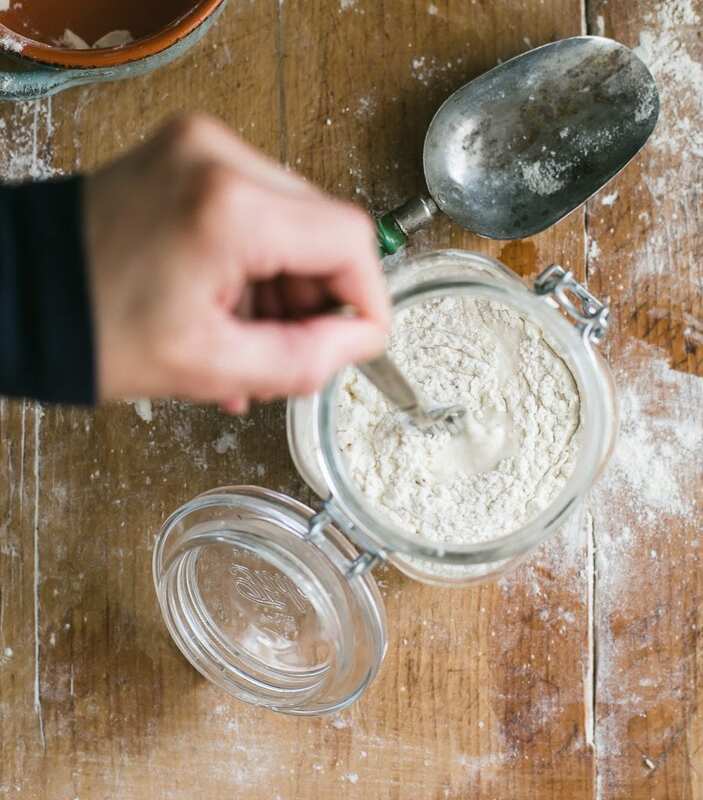 In the Fridge: If you don’t bake that often, store your starter in the fridge, loosely covered or with a lid. You’ll only need to feed it about once a week or so, to maintain its strength when not in use. 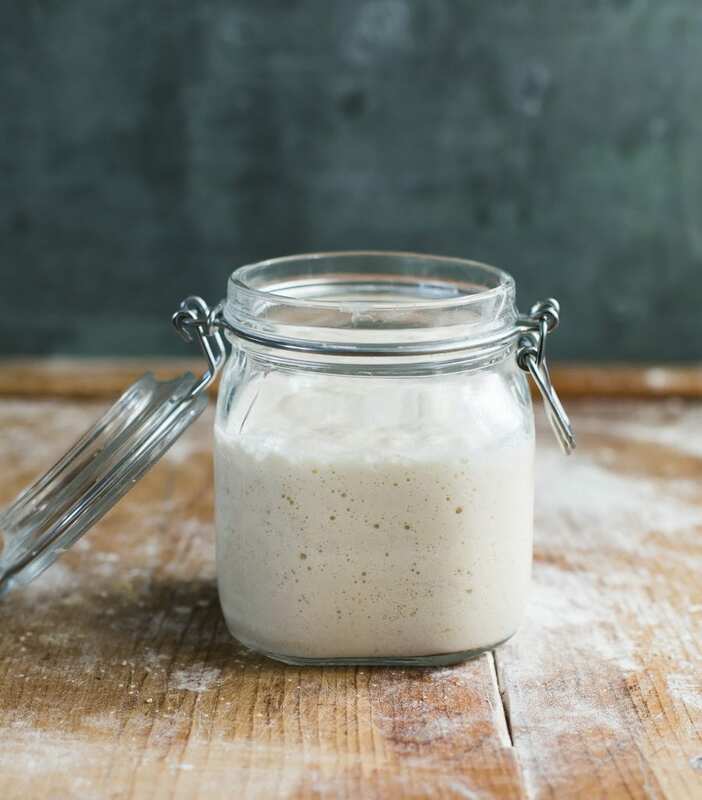 When you are ready to make dough, feed your starter at room temperature as needed, to wake it back up.